...... To begin, you need to add photos to the slideshow storyboard and arrange their order by dragging pictures with the mouse. Slides in the storyboard are separated by transition effects which are added to the slideshow automatically. However you can replace default effects with other transitions by dragging them to the storyboard from the library of effects. There are also slide templates that can be used to start or end the slideshow or separate slides that represent different themes. Templates are fully editable: you can add your own background picture, edit default text or add and format your own captions. 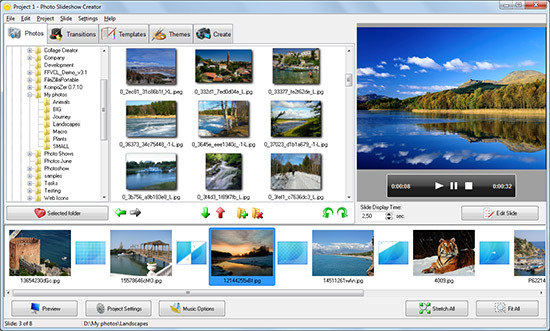 Qweas is providing links to Photo Slideshow Creator 2.81 as a courtesy, and makes no representations regarding Photo Slideshow Creator or any other applications or any information related thereto. Any questions, complaints or claims regarding this application Photo Slideshow Creator 2.81 must be directed to the appropriate software vendor. You may click the publisher link of Photo Slideshow Creator on the top of this page to get more details about the vendor.